Aloha…five letters…many meanings. Hello, goodbye, love, affection to name a few. For me I hear the word ‘aloha’ and think two things: Hawaii 5-0 (I love both series) and macadamia nuts. Friends of mine just got back from Hawaii. While they were there, I received a text message saying, “Aloha.” My mind wondered to sandy beaches, volcanoes and chocolate covered macadamia nuts. This in turn prompted me to head straight for the kitchen. I recently included macadamia nuts in my Triple Nut Clusters, so I eliminated the idea of dipping macadamia nuts into chocolate this time around. 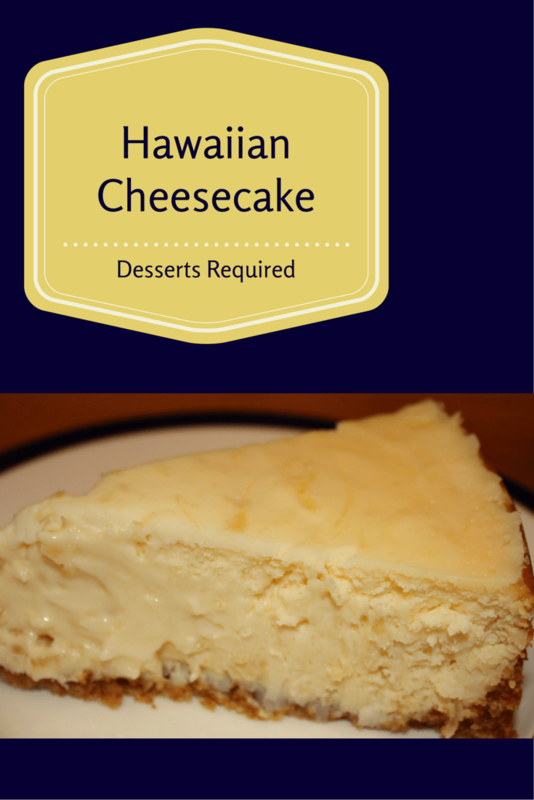 It had been a while since I made a cheesecake, so I opted to bake an Hawaiian Cheesecake to celebrate my friends’ trip. Macadamia nuts are toasted and processed into the graham cracker crust. The cream cheese filling includes crushed pineapple and shredded coconut. To top it off crushed pineapple is also added to the sour cream topping. The end result is a cheesecake that can transplant you to another place. A place filled with sunshine, lush foliage, wild surfing and tranquility. A place where the only word you absolutely have to know that will do justice to what you are eating: Aloha! Preheat oven to 325°. Set aside a 10” spring-form pan. Combine the graham crackers, macadamia nuts and sugar in a food processor bowl fitted with a metal blade and process until mixture is finely chopped. Add melted butter and pulse on/off until well blended. Grease the pan with nonstick cooking spray. Transfer crust mixture to the pan and pat evenly onto the bottom and up ¾“ of the side. Bake at 325° for 8 minutes. Set aside on a cooling rack. Beat the cream cheese and sugar until smooth and creamy, about 3 minutes, scraping the bowl down as needed. Add eggs, one at a time, and mix until smooth. Add 3½ ounces crushed pineapple and vanilla. Lastly mix in the coconut. Pour the filling into the pan and bake at 325° for 50 minutes. Remove from oven while preparing the topping. Combine the sour cream, confectioners sugar and 1 tablespoon crushed pineapple. Pour over top of cheesecake. Bake at 350° for 7 minutes. Remove from the oven and cool completely on a cooling rack. Remove the side of the pan once the cheesecake is at room temperature. Refrigerate for several hours or overnight. A drained 8 ounce can of crushed pineapple will yield the amount needed for the recipe. Oh-h-h! This is just so good! What an incredible combination. Loved the taste of the pineapple and the coconut. It wasn’t too overpowering; just enough to give that Hawaiian feeling. And the crust was the best ever. I hope you come up with additional recipes that will allow me to use the macadamia nuts, ground in with the graham crackers. If the filling weren’t so good, I would have peeled off the crust and eaten the entire thing by itself. But, no way would I have left that creamy, yet slightly crunchy Hawaiian filling. So unusual. I love it, when I get positive feed back on what I serve; and I sure got it with this. Thanks! Thank you so much M. for your comments. I will work on other macadamia nut/graham cracker crust recipes! Macky made this for me and I loved it. I’m not a fig fan of coconut but the combination with the pineapple and the amazing crust made it one of the best cheesecakes she’s ever baked and I’ve ever had!! Thank you Jimmy for letting me know. I have just made this for the 6th time. It seems to be my go to cake, when I want one that everyone will flip over. It is fantastic!!! I have made it, perfectly, every time. Today by mistake I left it in the oven with the topping for 8 minutes and not the 7 you state in the recipe. I know you are going to tell me it will be fine; but what I would like to know is the difference between the 7 minutes and the 8. In other words your reason for stipulating 7 minutes. I may not notice a difference but what difference would you note with the one extra minute. In case you haven’t guessed, I am a perfectionist! Thank you. You are correct. 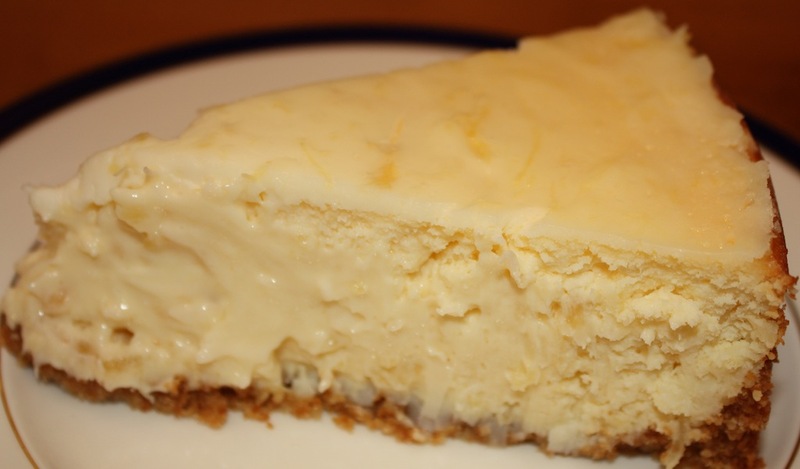 I know that your cheesecake will be wonderful whether you bake the topping for 7 minutes or 8 minutes. Having said that, the difference is that at 8 minutes, the sour cream topping can become a bit overcooked. Some of this is due to the temperament of an individual oven. If the topping is overcooked, it is still delicious but it has a bit of a more ‘rubbery’ texture around the edges. You are correct. The outer edges were a bit more rubbery. That said: 12 people ate the entire cheesecake!!! It was so-o-o-o, so-o-o-o delicious!!! !